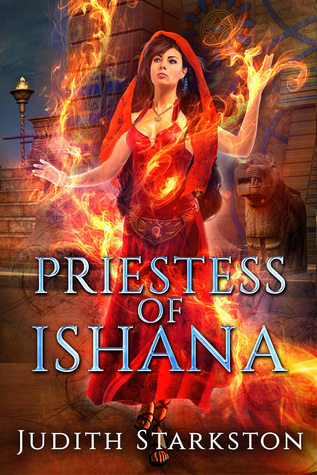 Tesha is the 15 year old high priestess of the goddess Ishana, a deity of war and love. Her duties and devotion to the goddess are strong and she carries out her role faithfully at the temple, believing she knows her life’s role. Until one day, two shepherds discover the charred remains of a man’s body in a cave, who had been killed by sorcery, a crime punishable by death. When the Great King’s younger brother, Hattu, arrives to Tesha’s city to deliver a great treasure to the temple as a sign of his devotion to Ishana, he is arrested for the murder of the man in the cave. Tesha and her blind sister, Daniti, are convinced that Hattu is innocent, but their father, Pentip, the Grand Votary and High Priest, believes otherwise. Acting against her father, Tesha meticulously searches for the truth that will set Hattu, with whom she shares an inexplicable bond and visions, free of his prison and save him from execution at his own brother’s command. This is exactly the historical fantasy novel you were looking for to round out your 2018 reading! The world building is intricate and painstakingly drawn, which is always pleasing. The pacing has a nice blend of faster action sequences combined with complex (but not convoluted) politics and religious rites. Each character has depth and personality, some of whom you love to hate. I thought Tesha in particular was a complex person, a woman in her own right who had some power as a respected priestess, but who was also a woman in a very different and much earlier society who adhered to some patriarchal rules. It was fascinating to see her carry out her duties as well as her investigation within the scope of the limits her society imposed upon her. The excellent author’s note at the end gives further insight into both the creation of the novel itself as well as the Hittites. I think a lot of people don’t know about the Hittites at all, or else only what is mentioned about them in the Bible. But their civilization was enormous and they had a ton of influence on the ancient world. They were literally lost to the sands of time and were only relatively recently rediscovered. There is still a lot we can learn about them, and frankly, learning history by way of well written fantasy novels isn’t a bad way to go. I think Judith Starkston has struck on a totally unique niche within the historical fantasy genre, and I can’t wait to see what she comes up with in her next installation in the series! **A slightly different, probably longer and better version of this review will also be posted at the very awesome book review site Discovering Diamonds. You should go check them out.